Importers in Kumasi say they are not happy with police personnel who extort money from them. According to the Kumasi Central Market Importers Association (KCMIA), the police always find dubious means to extort money from them on the highways which is negatively affecting their businesses. Members of KCMIA, whose membership is in excess of 300, said they would demonstrate if the extortion of money by the police does not stop. “We are also facing pressing problems, and if we do not see any improvement by the end of this month, we would embark on a demonstration,” they indicated. Nana Yaw Owusu Agyeman, Deputy Secretary of KCMIA, cited high import duties and depreciation of the cedi against major foreign currencies as major challenges. He also said illegal barriers on the highways, which the security agencies mount to extort money from importers should be removed immediately. “We are by this press conference sounding a final notice to President Nana Akufo-Addo, whom we collectively helped to win political power in 2016. “If the National Security agencies do not stop harassing us, we will advise ourselves when they come around,” Owusu Agyeman said during a well-attended press conference. “We, members of the above mentioned association, are giving ourselves up to the end of March 2019 and if nothing happens we will hit the street. 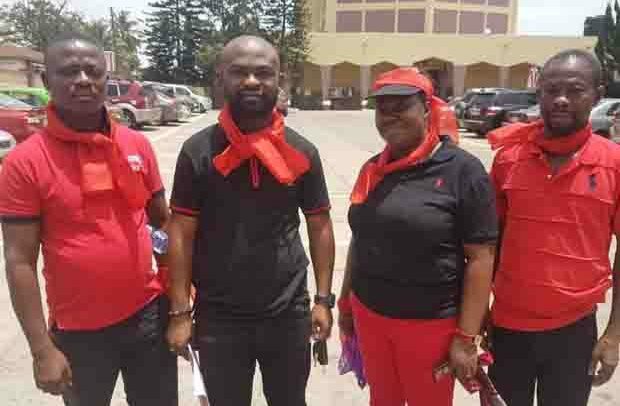 Mr. Owusu Agyeman said members of his association used their energy and resources to help the New Patriotic Party (NPP) to win power but present circumstances are forcing them to regret their action. Clad in red arm bands, members of the association chanted war songs after the press conference.